After studying film at Michigan State, then working as an assistant to director Richard Donner, Geoff Johns began writing comic books in 1998 and hasn't stopped since. Johns made his debut with Stars And S.T.R.I.P.E., a new take on DC Comics' Golden Age character The Star-Spangled Kid. He still considers it his favorite book, although it lasted just over a year. Maybe readers weren't accustomed to the approach that would become Johns' trademark: retrofitting classic characters for the current moment while making sure they maintained the elements that made them classic in the first place. They got used to it, however. Johns has written for Marvel (most notably on a long Avengers run), but has done more for DC, on titles like Hawkman, The Flash, JSA (first co-writing with Batman Begins screenwriter David Goyer, then going solo), and Teen Titans, a title he revamped and re-launched in 2003. Johns also recently reworked Green Lantern, resurrecting classic Silver Age hero Hal Jordan in the miniseries Green Lantern: Rebirth, then in a new ongoing series. While continuing to develop film and television projects, Johns has also served as a DC editorial consultant, helping plot the direction of the DC Universe, which is set to alter radically through Infinite Crisis, a sequel to the classic, drastic 1985 maxi-series Crisis On Infinite Earths. Infinite Crisis launched this spring with Countdown To Infinite Crisis and a quartet of related miniseries, but the project's direction and destination is being carefully guarded. Johns has the answers, but he remained tight-lipped about them when he spoke to The A.V. Club. The A.V. Club: If there's one thing that's characterized your work in DC, it's the way you've helped put pieces of the universe back together. Why take it apart now? GJ: We kind of do take it apart a bit, but the purpose of Infinite Crisis is to rebuild the DC Universe and try and propel it into the next heroic age. We're saying, "Let's move it to the next level, deconstructing some of it now and reconstructing it within the story of Crisis." GJ: This is kind of the rebirth. AVC: So it's kind of a continuation of what you have done with Hawkman and some of the other characters, where you've modernized them while restoring them to their classic status. GJ: Yeah, that's what we're trying to do, because there's a lot of new stuff coming out of Crisis, and it's sort of the bridge to get us there. But we're definitely trying to make it new but still iconic, if that makes sense. We don't want Dr. Fate to have a gold knife, but Dr. Fate will get completely overhauled during Crisis. AVC: The ostensible reason behind the first Crisis was that the universe was a mess and it needed to be put back into order. What's spurring this one? GJ: We can look at the universe as in a spiritual and emotional mess, and because the heroes are going to be at such odds, and so fractured, and relationships are all over the place—it's almost like the mess is internal and reflecting on the external. It's a little more about the characters than I think the first Crisis was. AVC: How much has that been set up over the past couple of years, and how much was a natural progression? GJ: I think equal parts. There are things that have obviously been purposely set up for a long while, and then there's other things that are kind of like, "Hey, that would actually play right into this." Whereas you're on one path, and that path… You know where you're going, but sometimes that path will veer left and right more than you thought it would. But it's almost always a good thing. 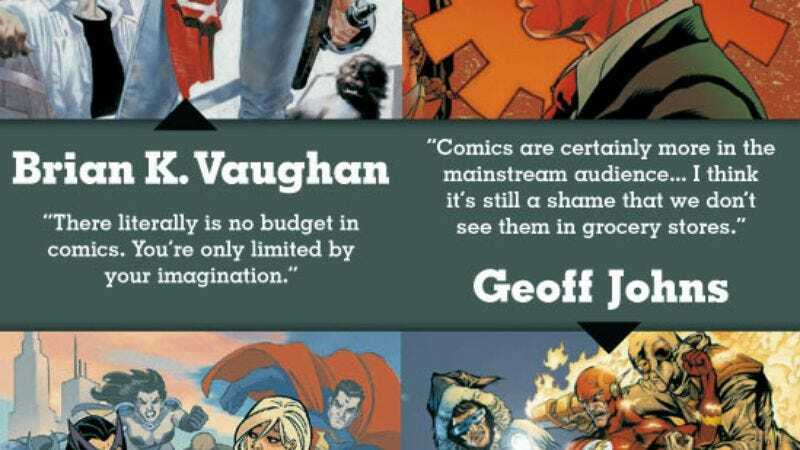 AVC: A bigger question is, how much of it is coming from stuff that you and the other DC writers have set up, and how much is it a corrective for the direction comics were going in the '90s? GJ: I don't know if I'd call it a corrective, I just call it "different." It's something that we're all trying to do, something different—different than what was done in the '90s and the '80s. It won't be going back to the status quo of 1985 or 1975 or '65. Hopefully we'll have something totally new for '06, but still have that flavor. Superman's Superman. Some characters will go through some radical changes, but at their very base, the themes and iconic aspects of that character will hopefully stick around. AVC: How much of a personal investment do you have in things like restoring Hawkman to a coherent origin that's more in line with the classic character, or bringing back Hal Jordan as Green Lantern? GJ: Everything I do is personal. For Hawkman, I just liked the character and I wanted to see him around. When David Goyer and I sat down and tried to figure out what his origin was, we went through all the aspects. How did we best feel we could explain him? And because we already worked with Hawkgirl, we went with the reincarnation angle. Really, it was kind of like—if we said he had many lives, I think it's a lot easier for the reader to swallow than if there's so many incarnations of Hawkman. To readers, it might make a little bit more sense. That was something we didn't feel was explored as far as that character went. We took a lot from John Ostrander, who wrote the book near the end, prior to us. We tried to take all aspects of it; we tried to try fit Thanagar into it. We didn't just say, "Let's go back to the Golden Age Hawkman," because there are quite a few elements we took liberties with, including his origin. AVC: So tell me about your new job in DC. GJ: I'm one of a couple of the guys that's just doing a lot of extra work, because I'm involved in Crisis and in contact with the majority of the writers there about what they're doing now, and what's coming out, and throwing that all into Crisis and helping to spin new directions… I guess they decided to compensate me a little bit more and ask for my input. I think my unofficial title is "consulting editor"—something like what Grant Morrison and Mark Waid are doing. So I just interact a lot with the editors and the writers for this stuff. We try to keep it all coherent so everything's in sync. It's almost like what happened to Hawkman. [With Crisis On Infinite Earths] they said, "Okay, we're going to reboot," but it almost felt like they weren't prepared for every character, because a year or two years after, they rebooted Hawkman. Hawkman already appeared post-Crisis, so there were all these inconsistencies for the readers. I think at that point, there were all these new readers at DC, and the inconsistencies are kind of detrimental to people really getting enraptured and engrossed in the DC Universe when they start doing reboots a year after they've rebooted already. That's something we want to avoid, and we just want to have all the directions and all the takes and everything figured out prior to getting there, so when we do it, it's clear across the board, it's one year later, and every character has been worked out. Hopefully we'll have a very consistent universe. And that doesn't mean that if Hawkman is in Japan one month, he has to be in Japan in every other book, but just that the character and the background and everything is consistent. That's one of my jobs to watch and help figure out. AVC: It sounds like a huge logic problem. Do you find that kind of attention to miniscule detail and coordinating of schedules and origins gets in the way of your creativity as a storyteller? GJ: Some of that, sure, but some of the creative ways… Like, with Green Lantern: Rebirth, I really enjoyed trying to figure out how I could get all the stuff in and make a story out of it. But these little things, like small inconsistencies, I'm really more focused on where the characters are going to go as characters, and working that into Crisis. I haven't really felt stifled or overwhelmed or anything, because I love this stuff. And most of the writers I talk to, I've already known for a long time. AVC: How encyclopedic was your knowledge of DC Comics, or comics in general, before you started writing them? GJ: It's pretty vast, DC especially. I know Marvel continuity, but I know DC continuity better. I think I can hold my own with [famously knowledgeable writer] Mark Waid on most days. On a good day. AVC: Speaking of Waid, you joined Flash after a well-liked run by him. What were your tactics for making it your own? GJ: That was easy, because I looked at what he didn't do. He didn't do Keystone City, and he didn't do Rogues. So I fleshed out Keystone City and tried to make it a blue-collar town and reflect on who I thought Wally West was, and then take the Rogues and try to make some interesting characters. AVC: How much of your depiction of Keystone City was inspired by growing up in Detroit? GJ: Oh, 90 percent of it, easy. It's what I know, so it's easy to write. I just like Detroit a lot, and I thought, more importantly—Wally runs fast, and Keystone kind of stands for something important. So if Keystone is the backbone of the American blue-collar industry, and they're the ones who keep America running by making cars and trains and engines and everything, for me, thematically it just worked. AVC: With Teen Titans, on the other hand, it seems like that was a house that wasn't in order when you came on. How did you approach that title? GJ: How I approach it is, I look at what the iconic things are, and that's what I want to build on. They have to live in a big T, because the tower—it's cool; everyone knows what Titans Tower is. I remember there was one point when they lived in bunkers, and it never felt the same. It could be anywhere—we'll put it on the West Coast instead of the East Coast. Just the name "Titans Tower," everyone knew. I looked at, obviously, the original series, the Wolfman/Perez run, which is the most successful Titans series, the one that inspired a cartoon. I looked at what they did, and they took the classic Titans of Robin, Kid Flash, and Wonder Girl, and then added the next generation with Cyborg and Raven and Starfire, and so I took the rebirth aspect. I tried to tap into some of the iconic values I think Wolfman and Perez instilled that people will never forget, and also bring in some of the next generation with some of these new characters. That's kind of where I started. AVC: You did a lot, particularly with the Flash Rogues, by putting a new spin on old characters. Are there any old characters you think are incapable of being revived for the modern age? GJ: As soon as I mention a name, someone will do a great job with it next month. I think it's like, whoever gravitates to certain characters… If they're really into that character and they have passion for it, you're going to get a great character no matter who it is. I think any character has potential. There are certain characters I don't have a huge affinity for… Like Rainbow Raider, I never really understood. But that doesn't mean someone can't make him interesting. AVC: Do you think comics are poised to recapture some of the readership they lost in the '90s? GJ: They've been doing better in the last three or four years. Comic sales are up. They say trades are up. I have never seen numbers, but I don't know why they would ever not be truthful about it. Comics are certainly more in the mainstream audience… I think it's still a shame that we don't see them in grocery stores, where I used to buy them. I think there's material for everybody. Kids are just going to have to buy comics by accident unless someone knows an adult that will take them to a comic shop. I think if a dad says to a kid, "Hey, let's go to the comic shop, and here you can read the same comics I do! "… If a kid's 13, I don' t know if he's necessarily going to want to read what dad does.